On Saadiyat Island, just off the coast of Abu Dhabi, branches of iconic cultural institutions, including the Louvre, the Guggenheim, the British Museum and New York University, are taking shape to the designs of starchitects such as Frank Gehry, Jean Nouvel, Zaha Hadid, and Norman Foster. In this way, the United Arab Emirates (UAE) seeks to burnish its reputation as a sophisticated destination for wealthy visitors and residents. Beneath the glossy veneer of the Saadiyat real estate plan, however, lies a tawdry reality. Those laboring on the construction sites are migrant workers who arrive from poor countries heavily indebted as a result of recruitment and transit fees. Once in the UAE the sponsoring employer takes their passports, houses them in sub-standard labor camps, pays much less than they were promised, and enforces a punishing work regimen. If they protest publicly, they risk arrest, beatings, and deportation. 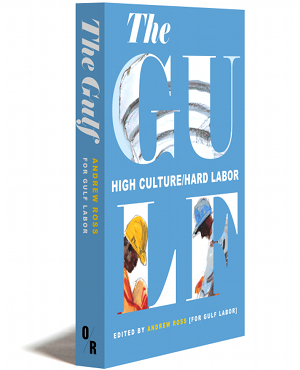 For five years, the Gulf Labor Coalition, a cosmopolitan group of artists and writers, has been pressuring Saadiyat’s Western cultural brands to ensure worker protections. Gulf Labor has coordinated a boycott of the Guggenheim Abu Dhabi and pioneered innovative direct action that has involved several spectacular museum occupations. As part of a year-long initiative, an array of artists, writers, and activists submitted a work, a text, or an action. Contextualized by essays that trace how Gulf Labor has evolved, their contributions are reproduced in this book. The result is a compelling chronicle of a campaign at the forefront of a new wave of world-wide cultural activism. Written contributions by: Haig Aivazian, Mounira Al Solh, Ayreen Anastas, Kadambari Baxi, Doris Bittar, Jordan Carver, Paula Chakravartty, Nitasha Dhillon, Rene Gabri, Mariam Ghani, the Global Ultra Luxury Faction (G.U.L.F. ), Hans Haacke, Guy Mannes-Abbott, Naeem Mohaiemen, Walid Raad, Andrew Ross, Gregory Sholette and Mabel Wilson. Artwork contributions by: Hend Al Mansour, Ayreen Anastas and Rene Gabri, Todd Ayoung and Jelena Stojanovic, Mieke Bal and Michelle Williams Gamaker, Zanny Begg and Oliver Ressler, Emily Verla Bovino, CAMP, Collective of Artists, Carole Condé and Karl Beveridge, Sam Durant, Claire Fontaine, Andrea Fraser, Mariam Ghani, Paul Graham, G.U.L.F., Gulf Labor West, Hans Haacke, Rawi Hage, Pablo Helguera, Thomas Hirschhorn, Aaron Hughes and Sarah Farahat, The Illuminator, John Jurayj, Janet Koenig, Silvia Kolbowski, Lynn Love and Ann Sappenfield, Guy Mannes-Abbott, Mazatl, Pat McElnea, Jasa Mrevlje, Marina Naprushkina, Jenny Polak, Walid Raad, Georges Rabbath, Jayce Salloum, Rasha Salti, Dread Scott, Gregory Sholette and Matthew Greco, Andreas Siekmann and Alice Creischer, Nida Sinnokrot, Situ Studio, Suha Traboulsi and Jaret Vadera. 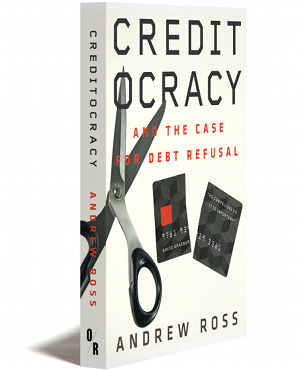 Andrew Ross is Professor of Social and Cultural Analysis at New York University, and a social activist. A contributor to The Nation, the Guardian, New York Times, Al Jazeera, and Artforum, he is the author of many books, including, most recently, Creditocracy and the Case for Debt Refusal. The Gulf states are hardly alone in their dependence on tragically underpaid and ill-treated migrant workers. Every developed and fast developing country has its own record of shame. But these nations are in a league of their own. The opulent lifestyle of a minority—composed of citizens and corporate expats—is maintained by a vast majority (up to 90 percent in the United Arab Emirates and Qatar) who function as a servant class, with no rights and very little mobility, and whose compliant labor is secured through the fear of abuse and deportation. Their plight is so acute that, in recent years, the push to reform the cruel kafala system (instituted as a temporary guest program in the early 1970s) has become an international cause. By the end of 2014, the Gulf Cooperation Council (GCC), which comprises Bahrain, Kuwait, Oman, Qatar, Saudi Arabia, and the United Arab Emirates (UAE), was facing down a flood of overseas pressure to dismantle the kafala system. Spearheaded by Human Rights Watch, more than 90 human rights groups, many from the workers’ countries of origin, signed a call for wide-ranging reforms of labor migration policies. Following allegations by the International Trade Union Confederation of “exploitative practices that may amount to forced labour,” the International Labor Organization (ILO) launched an official investigation of the UAE.3 Amnesty International released a report, titled There is No Freedom Here, on the treatment of political dissenters in the Emirates.4 In response to the soaring death toll among the Nepalese working on Doha’s construction spree, FIFA, the global football federation, was hotly petitioned by its European members to insist on labor reforms as a condition of Qatar’s hosting the 2022 World Cup.5 Investigative journalists from leading media organizations routinely filed front-page stories about the human cost of importing a workforce so vulnerable to abuse. Though its name did not always appear alongside those of the NGOs and high-profile advocacy groups, the Gulf Labor Coalition has played a key role in raising awareness of labor exploitation, especially in the UAE. An international network of artists and writers, energetically focused on Abu Dhabi’s development of a new cultural zone on Saadiyat Island, Gulf Labor was able to do and say things that the more official organizations could not. Our creative approach to activism was inspired and innovative, and, in some respects, unique in the field of labor advocacy. More decisive was the position of our artist members as coordinators of cultural value, with some leverage over the politics of constructing museum branches of the Guggenheim and Louvre on Saadiyat. While human and labor rights groups are denied entry into the UAE, and have only limited access in neighboring Qatar, the strenuous project of nation-building in both countries requires a degree of openness to producers of high culture. Art, after all, has become a status component of the amenity environment demanded by the GCC’s affluent residents and visitors. Museums, galleries, and trade fairs are now obligatory landmarks for the global investor class. As the essential brokers of acquisitional prestige, cultural producers have to be courted, but only if they hold their tongues, and turn a blind eye to the daily suppression of basic rights. Because the constituencies it represents are both sought out and feared, Gulf Labor was probably in the right place at the right time. Over time, our members were regularly consulted by the NGOs, our reporting was cited in the media exposés, and the publicity generated by our actions reached a much wider audience than the communities of conscience who typically respond to reports about human and labor rights violations.